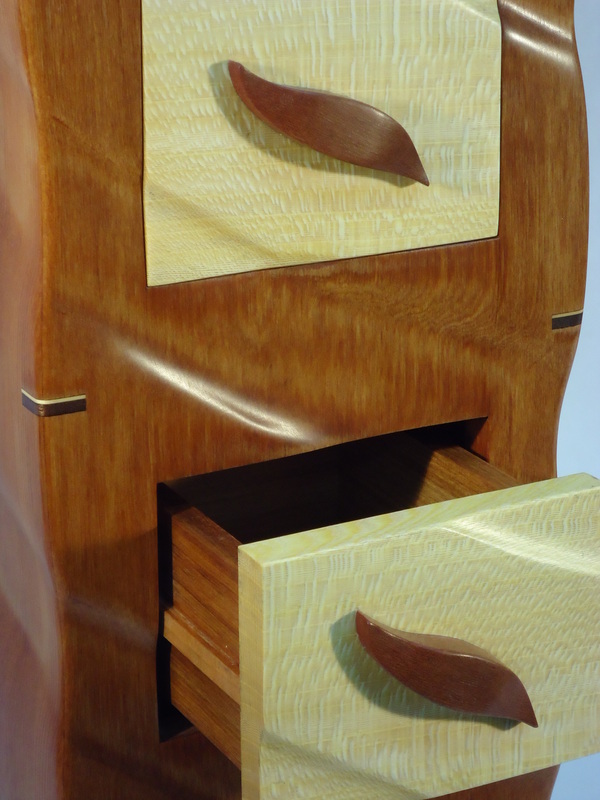 A desk or jewellery box with sculpted sides of Marlborough Oak. 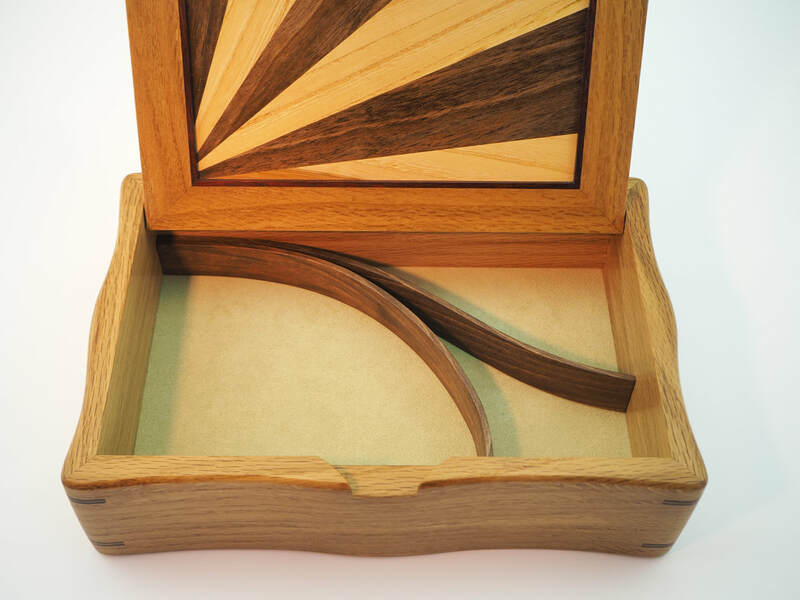 The Art Deco design lid is created from Marlborough Elm, Walnut and Lacebark, all rescued local woods, with a border and handle in recycled Jarrah. 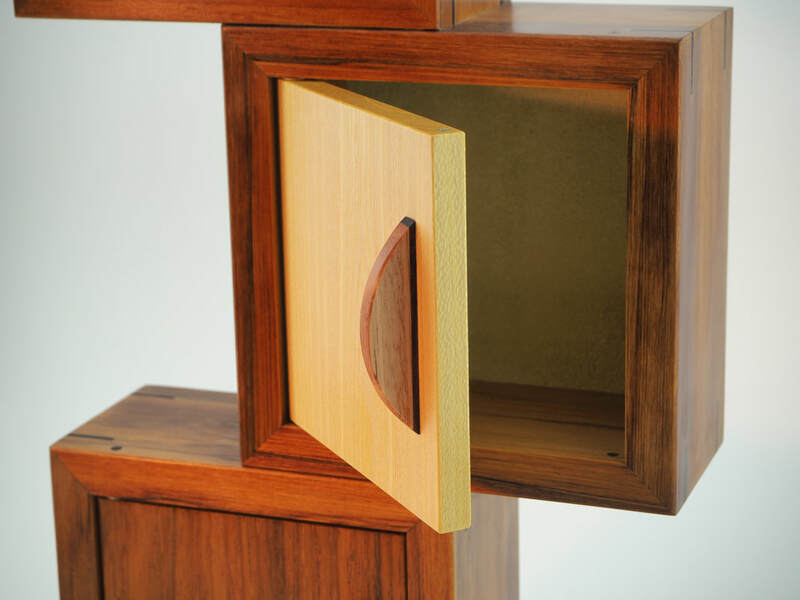 The interior has a removable curved divider made from Walnut. 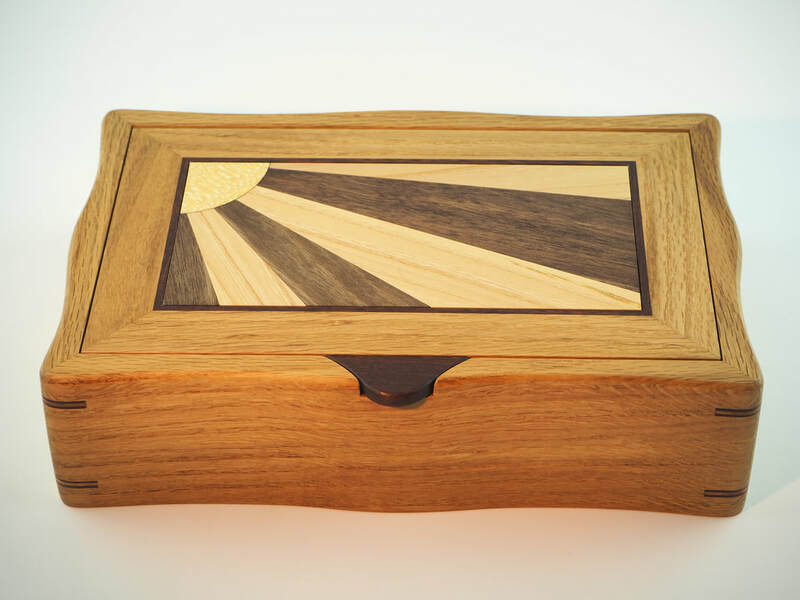 A landscape box made from some beautiful local rescued woods. 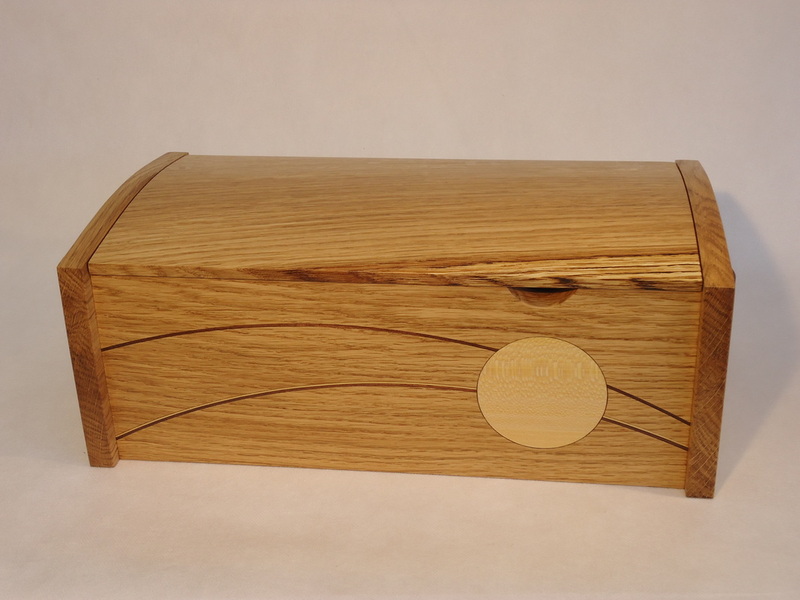 Oak for the box came from a 100 yr old tree that grew in the playground at Rapaura School Marlborough. 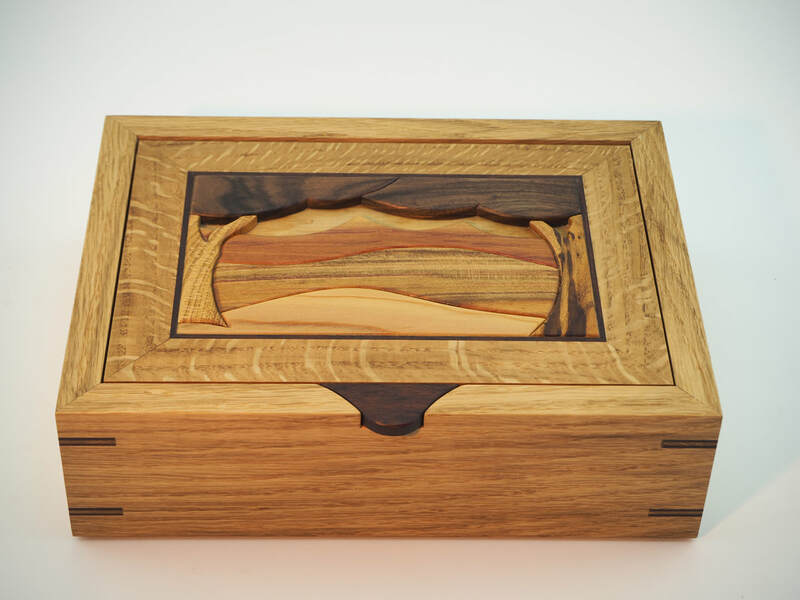 The intarsia lid shows the natural colours of Walnut, Cherry, Plum, Cedar, and Almond with a border and handle in recycled Jarrah. 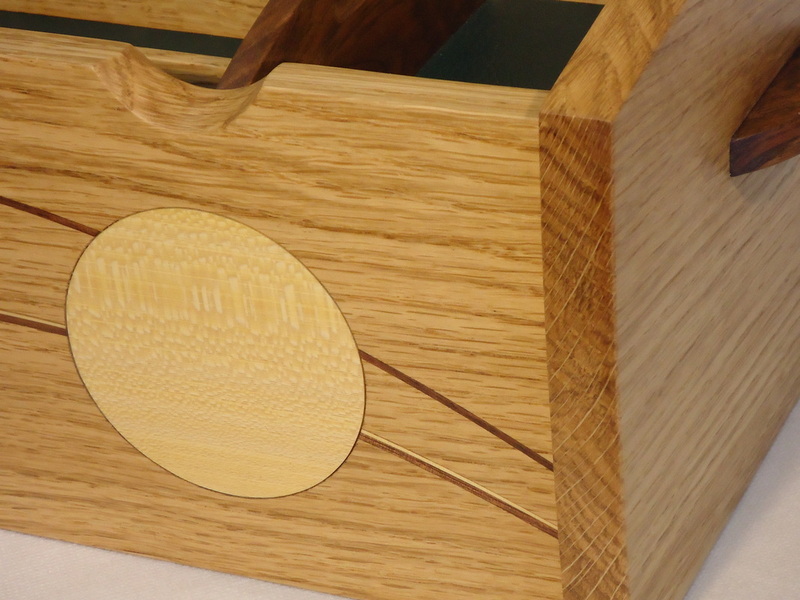 Finely finished with natural danish oil and citrus beeswax. 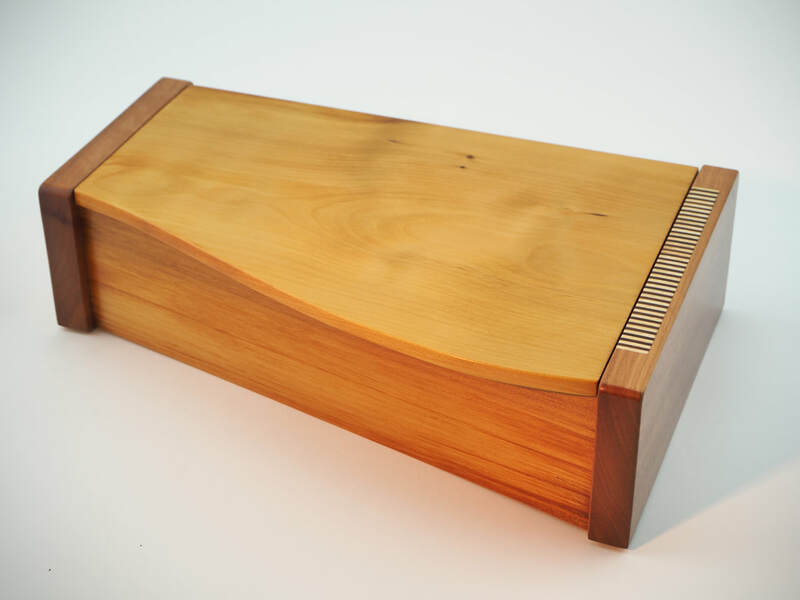 Harmonising some beautiful New Zealand woods, This desk or Jewellery box has sides of Red Beech and a lid of recycled Matai; the piano keys are inlays of Jarrah and Poplar. 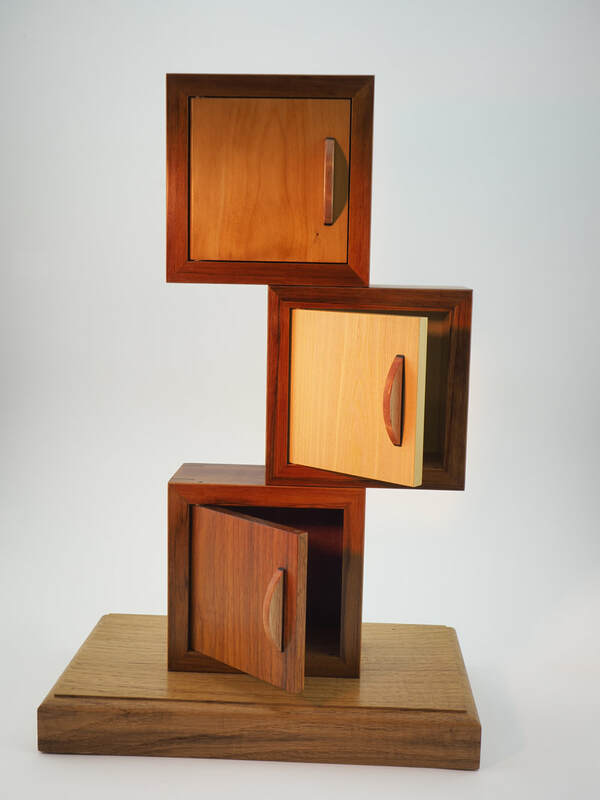 Taking inspiration from the architectural design of buildings such as Manhattan's New Museum of Contemporary Art, this is a series of square boxes, offset from one another to give an asymmetric form. 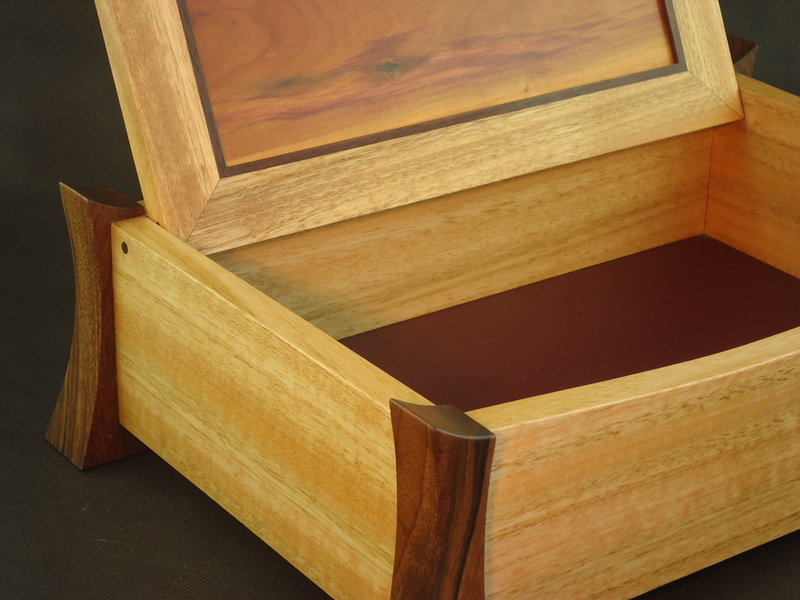 Recycled Rimu boxes with contrasting doors of Matai. 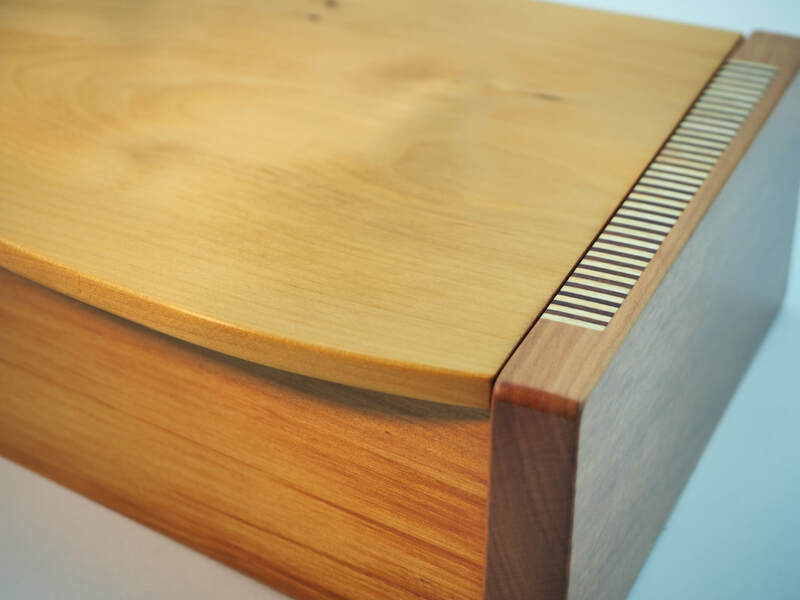 Lacebark and Eucalypt set on an Oak plinth. 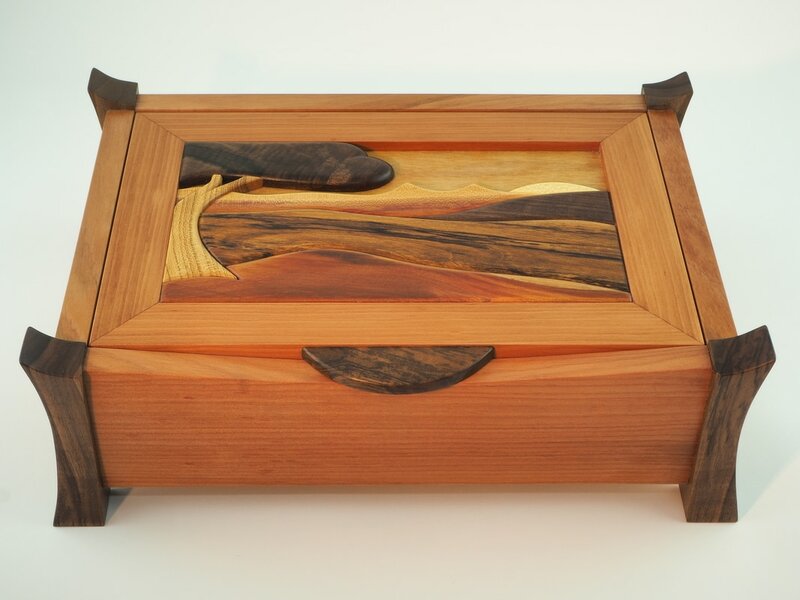 Combining the rich colours of rescued and recycled New Zealand woods into a beautiful landscape, this box is constructed using Red Beech with Walnut posts and handle. 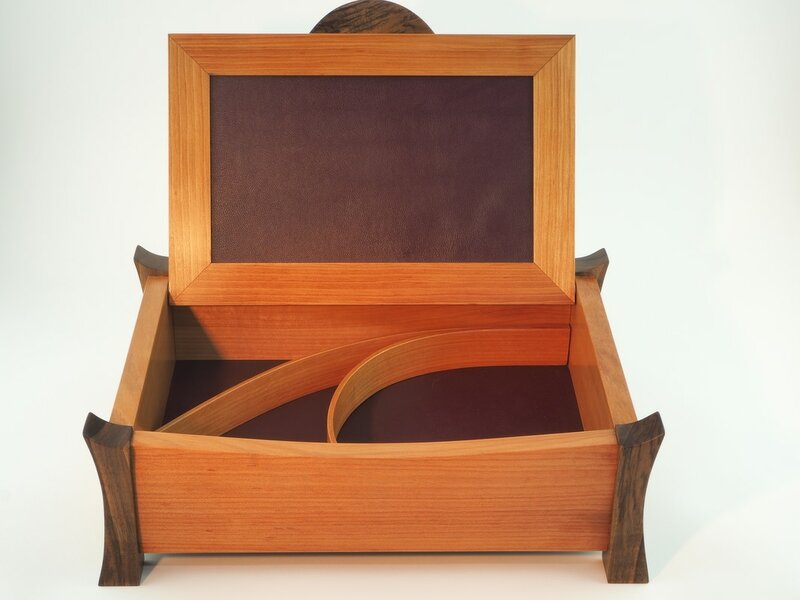 The Intarsia lid has Matai, Spalted Cherry, Almond, Plum, Walnut and a Lacebark sun, all within a Red Beech frame.​ The interior is lined with burgundy leather and divided by curves of Red Beech. 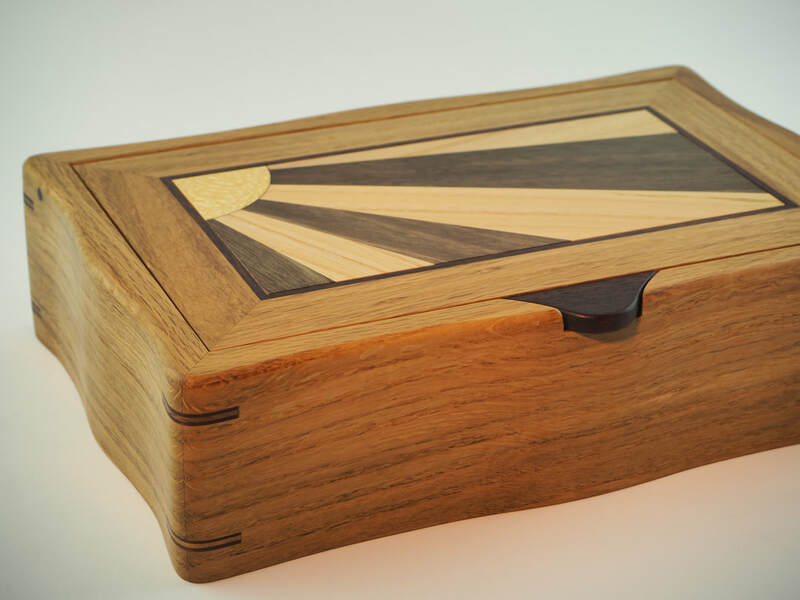 Darkness and light. 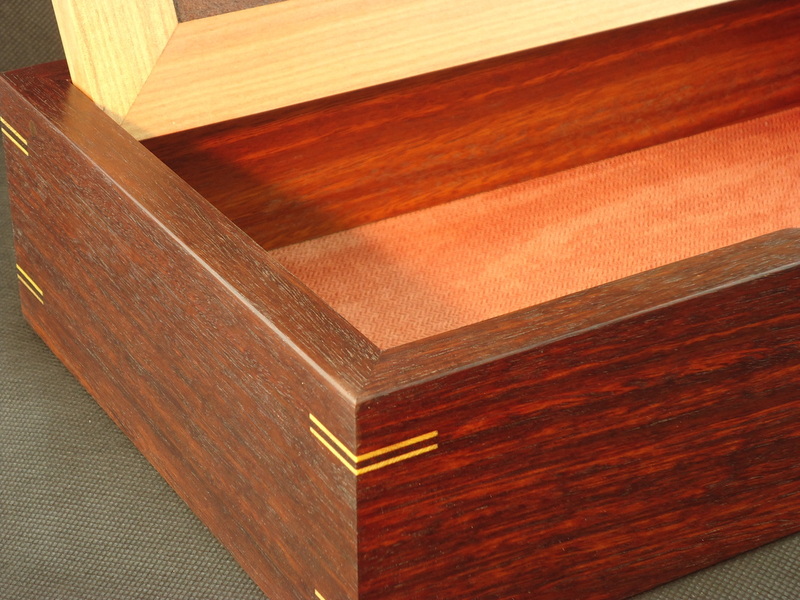 These two boxes highlight the beautiful colours of Jarrah and New Zealand Lacebark. 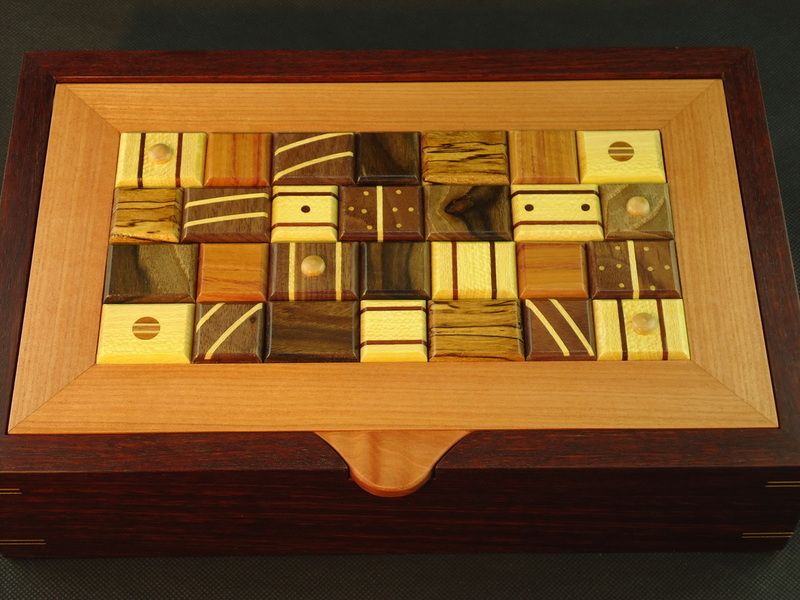 Finely finished with natural oil and beeswax. 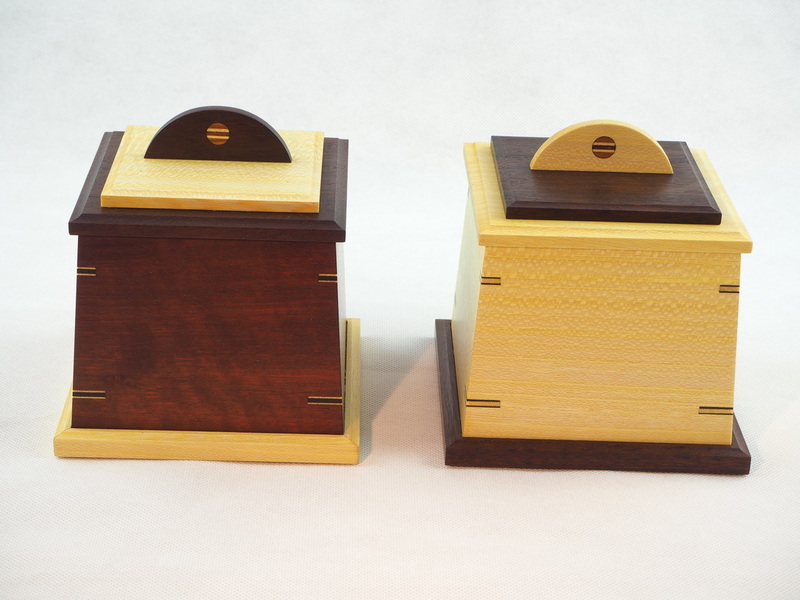 Ideally suited for rings, earrings, cufflinks or simply as a special gift. 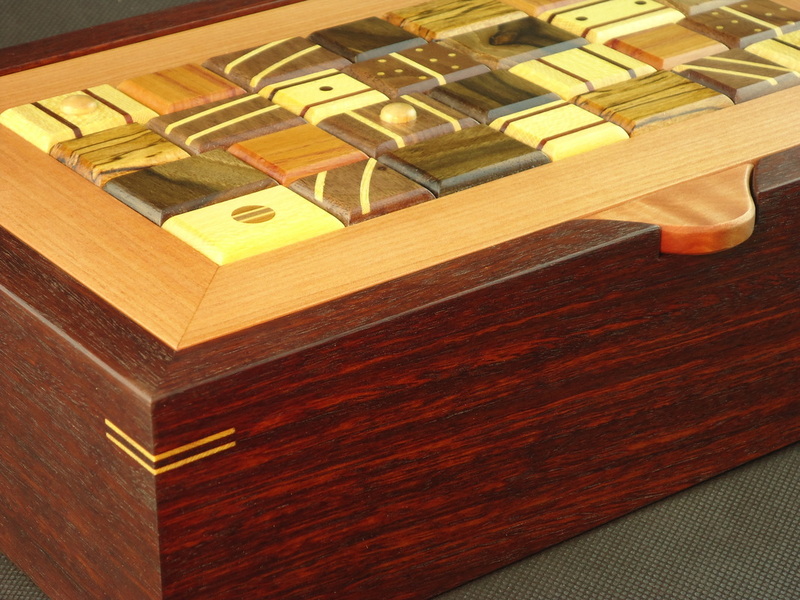 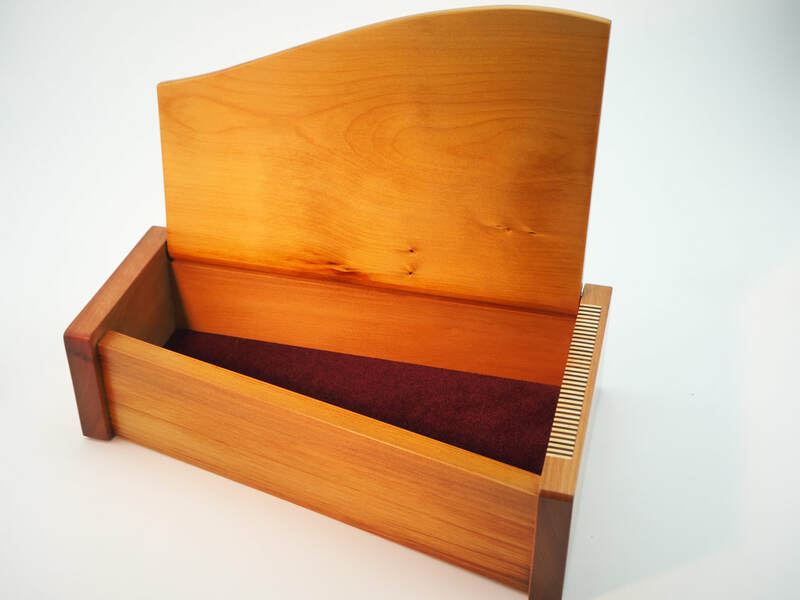 A Jarrah and Red Beech box with corner inlays of Lacebark. 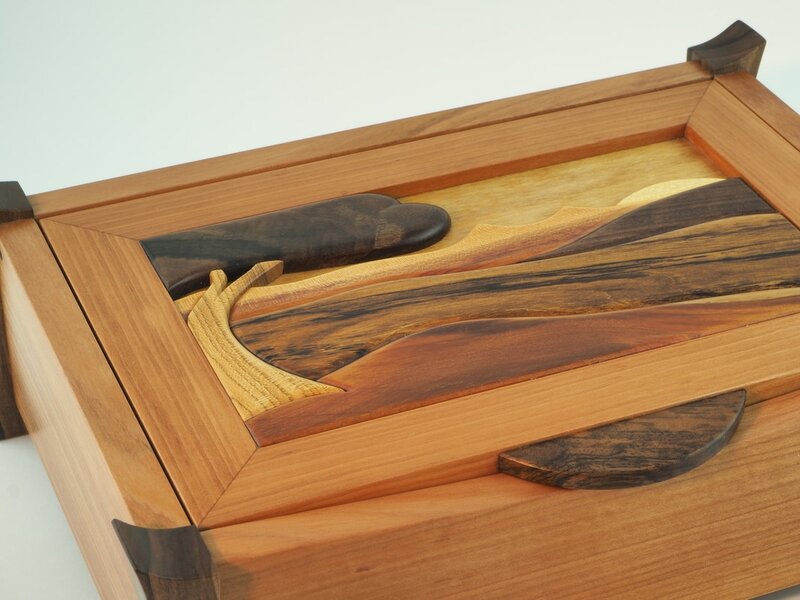 The top features a selection of hand made chocolates, dark, milk and white, all created from some beautiful woods - Lacebark, Walnut, Plum, Spalted Cherry, Rimu and Jarrah. 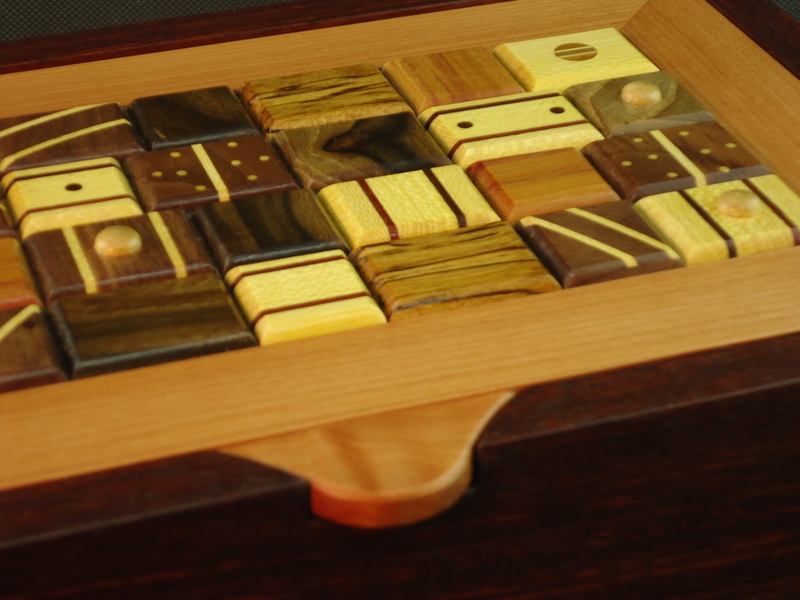 All the wood colours are completely natural as no stains or dyes are used. 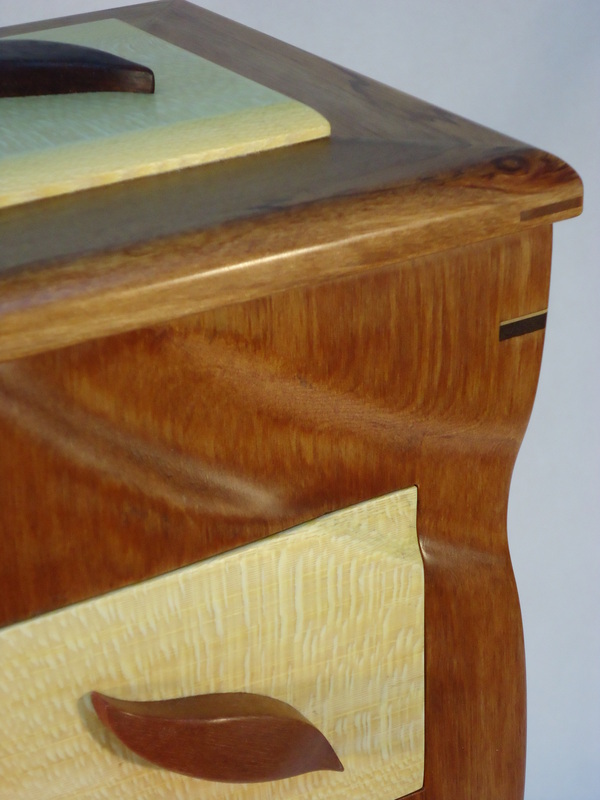 Finely finished with Danish Oil and polished with Beeswax mixed with Citrus oils. 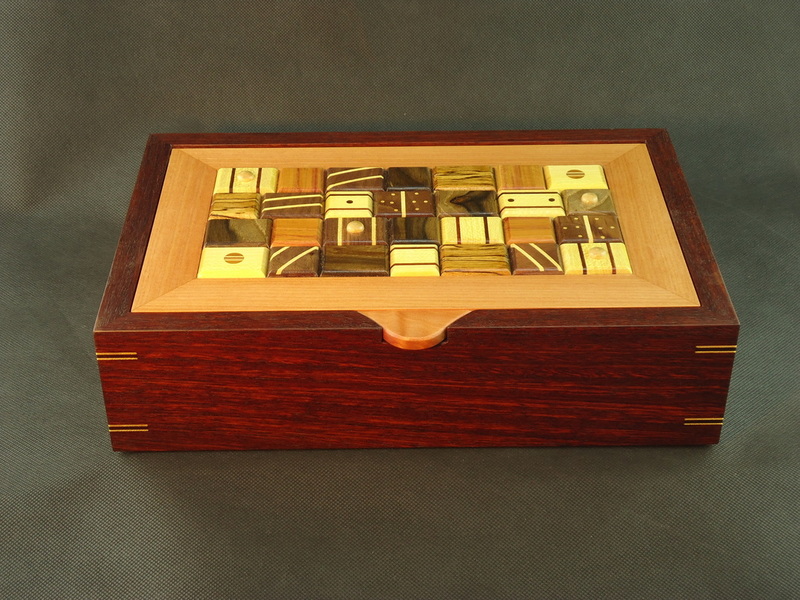 A box made from Obliqua, a Eucalyptus, with ​Walnut posts and handle. 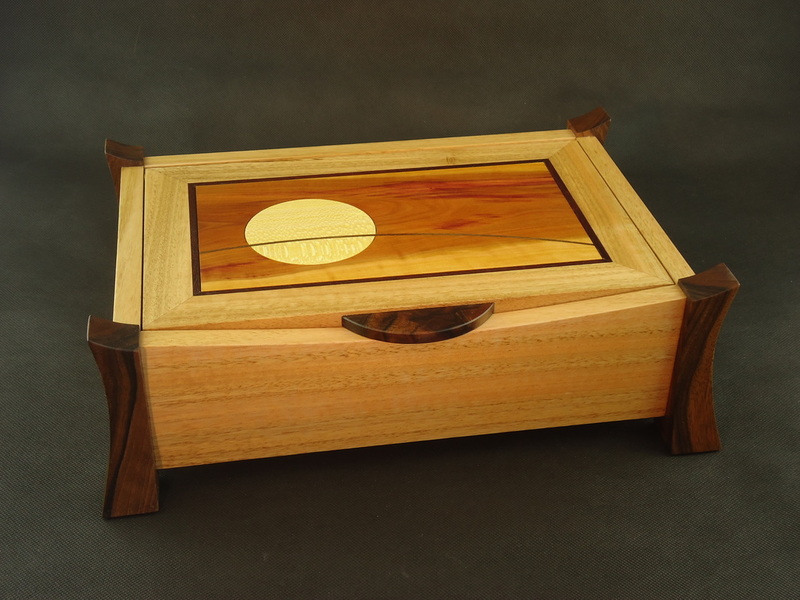 ​The lid has a centre panel of beautifully coloured Plum wood with a Lacebark sun and an inlaid arc of Walnut. 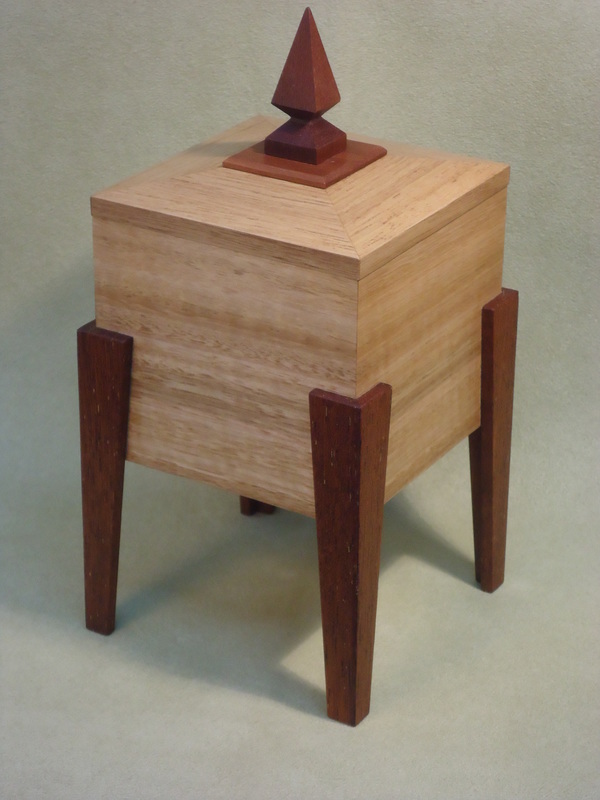 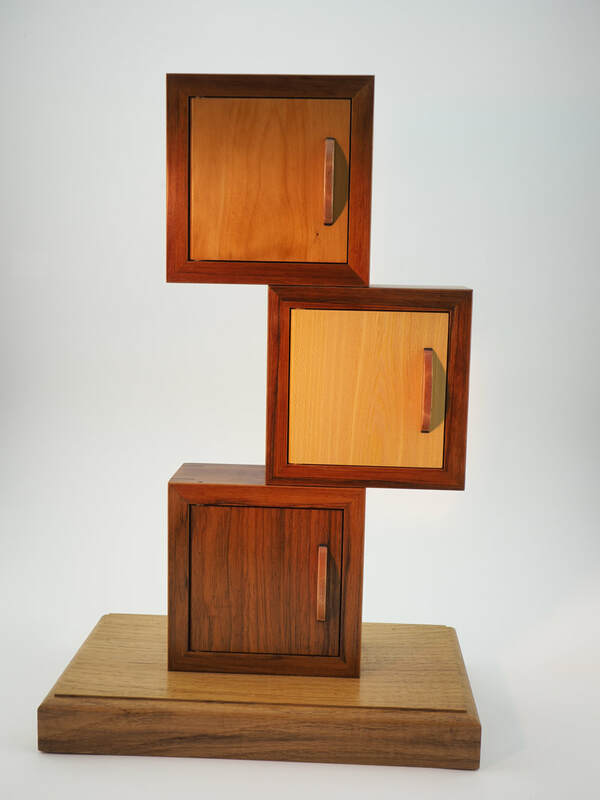 A box for precious things that stands tall, made from oblique with legs and handle of jarrah. 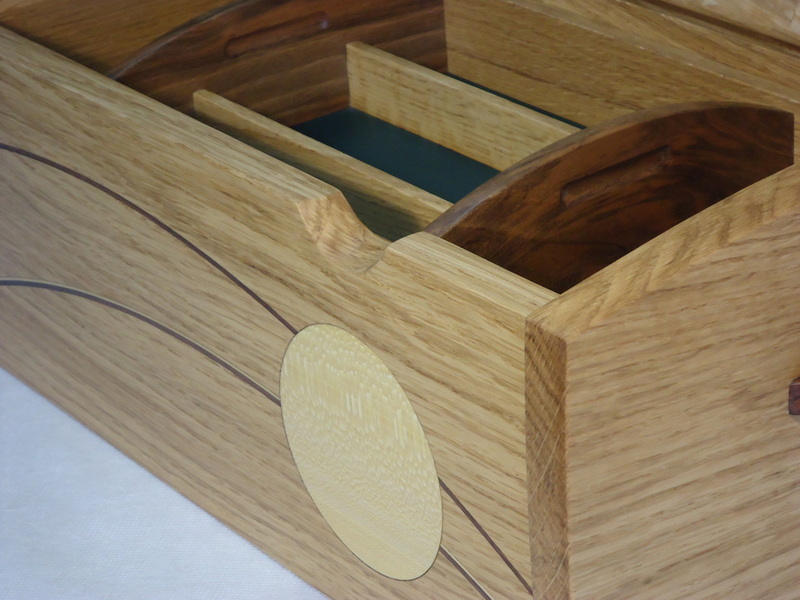 This large box, with it's curved lid is made from Oak with Walnut inlays, walnut side handles and a disc of Lacebark . 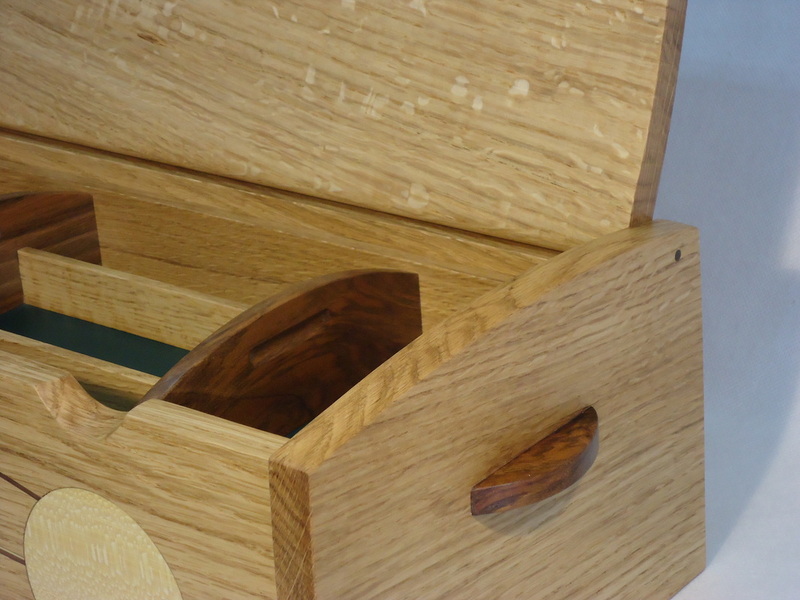 The interior has a removable tray of Oak and Walnut and a generous lower compartment, giving you lots of space. 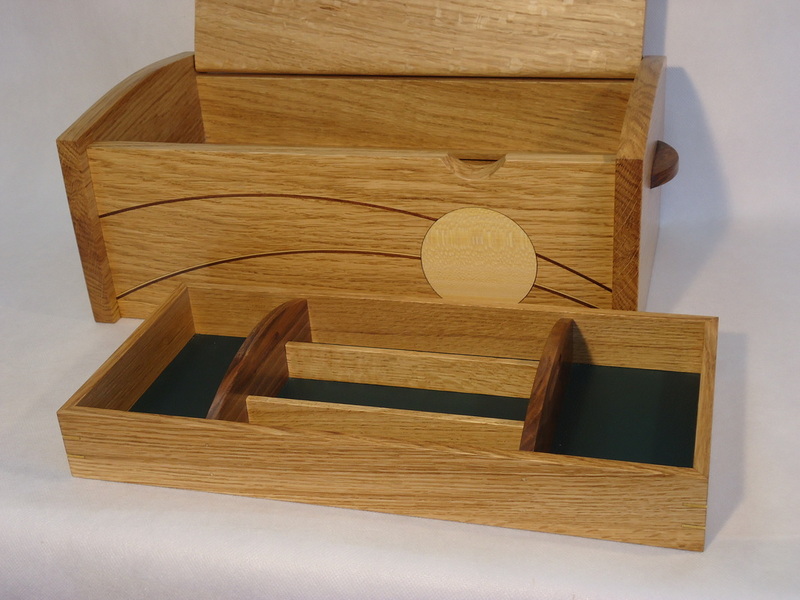 A useful box for sewing, knitting, arts and crafts or a roomy jewellery case. 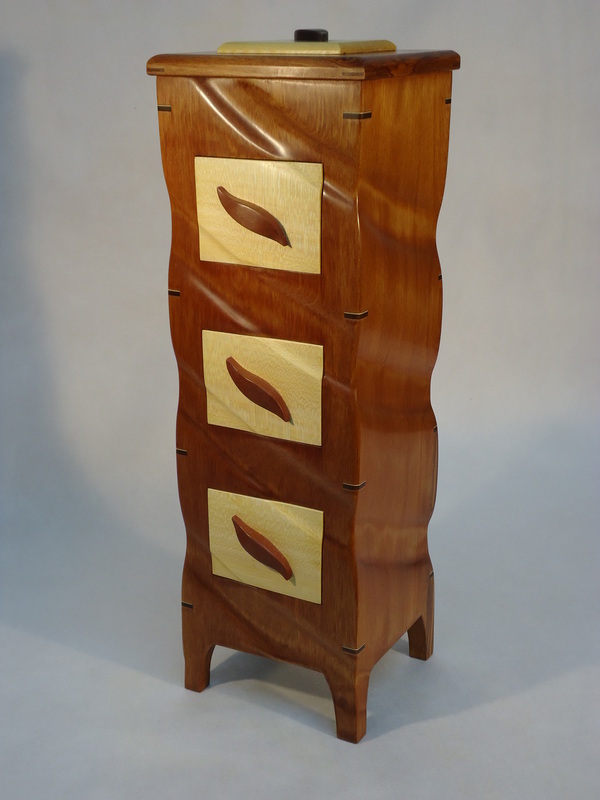 This box is a sculpted tower of recycled Rimu with drawer fronts of Lacebark. 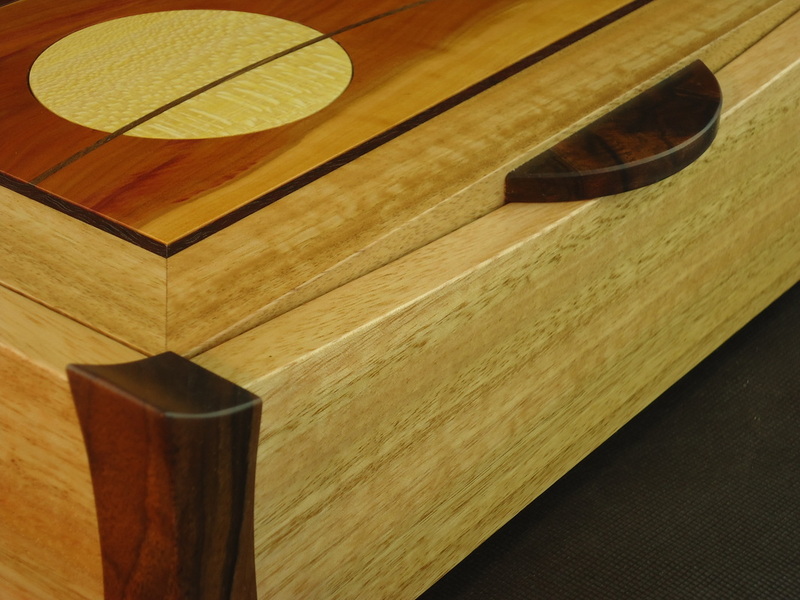 The drawer handles are carved from recycled Jarrah.